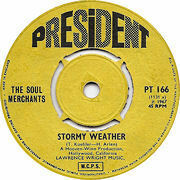 President records was started by Ed Kassner and his son David in 1966. They also added the Joy and Jay Boy labels as subsidiaries. They issued USA soul music in the early years and some reissues and reggae in the late sixties. New USA music came from the One-Der-Ful / Mar-Vel-Ous M-Pac labels out of Chicago. Also a scattering of early Pop, produced by home grow talent, which later came to dominate the label in the seventies. UK artists were also issued, with the Equals having chart success. The Equals 'Baby Come Back' made No 1 in July 1968 having previously been issued in 1966. 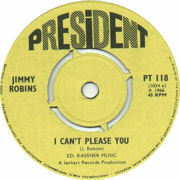 Issued as 118 Jimmy Robins "I Can't Please You" has become a Northern soul dance floor collectors item. From Texas born James Ray Robbins, he also played the Hammond organ, which features in his many recordings. Originally issued on the USA Impression label, it was picked up by Bob Lee in Chicago who put them out on his Jerhart label. The flip "I Made It Over" is a deep soul treasure and can be found on the fourth volume of Dave Godin's "Deep Soul Treasures". The rarest record on the label, it sells for hundreds of pounds, that is if you can find one! Viola Wills born Viola Mae Wilkerson in the Watts district of Los Angeles. In 1965, she was discovered by Barry White who signed her to Bronco Records. She recorded several sides for the label and "Lost Without the Love Of My Guy" was an early release. She later went on to achieve success with "Gonna Get Along Without You Now" in 1979. 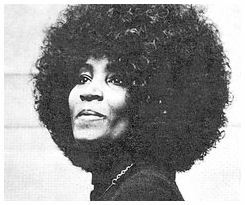 Felice Taylor was born in California, and began singing with her sisters Norma and Darlene in a group called the Sweets in 1965. She moved as a solo artist to Bob Keane's Mustang label and teamed up with song writer and producer Barry White, who co-wrote "It May Be Winter Outside (But In My Heart It's Spring)". "I Feel Love Comin' On" which was only issued in the UK made No 11 in 1967. 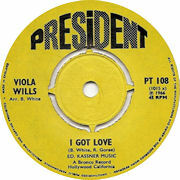 Barry White had one 45 issued on President "All In The Run Of A Day" Barry's first UK release. 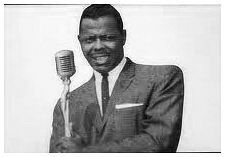 Harold Burrage recorded R&B for Cobra and Vee Jay, and later was a recording artist for Chicago's One-Der-Ful label. "You Make Me So Happy" was issued on a new subsidiary label M-Pac in 1967. He died from a heart attack at the age of 38. 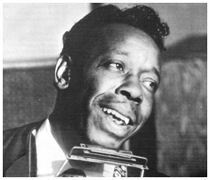 Slim Harpo, the blues guitar and harmonica player, has two singles issued both double headers. "I'm Gonna Keep What I Got / I've Got To Be With You" and "Tip On In" parts 1 & 2. Born James Moore in Lobdell, Louisiana he was never a full time musician. He began performing in Baton Rouge bars under the name Harmonica Slim and later accompanied his brother-in-law, Lightnin' Slim. Recorded by producer J.D. 'Jay' Miller, in Crowley, Louisiana for Excello Records Nashville, Tennessee. His many self-penned R&B songs were covered by sixties pop bands in the UK, including the Rolling Stones, Canned Heat, Them, Pretty Things. He died in January 1970 aged 46. Sadly, he never got to tour the UK. Other rare and collectable records; Alvin Cash The philly freeze /No deposits, no returns / Alvin's Boo-Ga-Loo / Let's Do Some Good Timing / The charge / Different strokes for different folks / Twine time / Twine awhile, Otis Clay Show place / That's how it is, Johnny Wyatt This thing called love / I got love, Albert Washington These arms of mine / I'm the man, Soul Merchants Stormy weather / Whole lot of loving, Kip Anderson You'll loose a good thing Willie Parker You got your finger in my eye / I live the life I love, Terry Lindsey It's over / One day up one day down, Betty Everett Getting mighty crowded / It's in his kiss / You're no good / Hands off, Billy Preston Billy's bag / Goldfinger, Darlettes Lost / Sweet kind of loneliness, Five Du-Tones Shake a tail fether / Divorce court / Betty Everett Trouble Over The Weekend / The Shoe Doesn't Fit, Du-ettes Every beat of my heart / Sugar daddy, Please forgive me / Lonely days, Sharpees Tired of being lonely / Just to please you, Witches & The Warlock Behind locked doors. Note I have not included the many pop records that now sell for ridiculously high sums such as the Renigades and Hat & Tie.